Invigorates, instantly softens the skin. 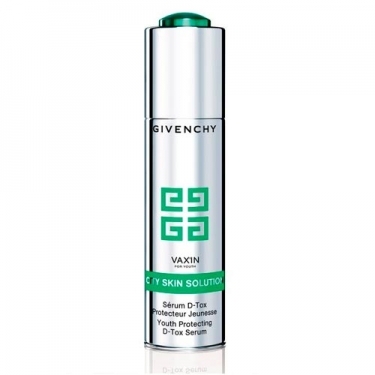 DESCRIPTION: Vaxin Eau Detox from Givenchy is a facial treatment serum formulated to care for urban skin, which suffers from the effects of pollution. It has a concentrated formula to restore vitality and promote anti-aging action. Leaves skin looking youthful. The fresh texture and gentle serum formula repairs and softens the skin instantly. With frequent use, the skin becomes more radiant, treated and revitalized, without the undesirable signs of pollution. It stimulates the skin's natural defense and restores youthful appearance damaged by pollution in the atmosphere. With clean and dry skin, apply on face and neck, morning and evening.